We need to talk about your tight shoulders! 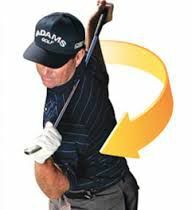 Shoulder tightness, like lower back tightness in golf is closely tied with postural restrictions identified through the middle section of our spine. If you have an overly rounded middle spine (thoracic spine) then you will not be able to rotate efficiently and completely through your middle spine and the rotational demands of the full golf swing will force your shoulders and/or lower back to compensate for your lack of motion in your middle spine... thus creating excessive stress and potential injury to your shoulders and/or lower back. Is this something that might be getting in the way of your swing? You may already know that you have tight shoulders or you might not be sure. I have a test for you (see below) to take at home so you can see how it might be restricting your swing. If you do test positive' for having tight shoulders, then here are some examples of how it can impact your swing. Stand near a mirror and reach one had behind your back and across your shoulder blade. The opposite hand will go across your low back with palms facing out. The top hand will reach down as far as possible and the lower hand will reach up as high as possible. If not, is it your top hand (external rotation) or bottom hand (internal rotation) that is preventing you from touching? If you can touch both hands together then you have normal or good flexibility. If you can grasp your hands together or overlap them from behind, you have excellent flexibility. And what if they are far apart? You won't be surprised to learn this is an area you will need to improve. Remember, having your golf body evaluated by a golf fitness expert is the best and safest way to be sure that you are getting the specific help you may need to reach your total golf performance potential. I encourage you to schedule a complementary consultation with me right away to get you started in this process. But, until I hear from you, here are '2' simple and very effective chest and shoulder flexibility exercises that can quickly help you gain the middle spine, chest and shoulder mobility in tip-top golf shape.